Hi, I'm Richard Brooks. We're talking about countertops made from the metal zinc. Now zinc is a metal, and is the most common element on the planet earth. It's in baby powder. It's in most of the tools and things we use in everyday circumstance. Zinc is safe. It's non-toxic. It's a hygienic metal. It's great for food prep. It's a charming metal. You have to remember; zinc is soft metal. It can scratch. It won't dent. It will patinate in time. It will take on a very dull pewter color. It's commonly used in traditional kitchens or butler’s pantries and kitchen islands. Now let's take a look at some of the finishes available using this incredible material. Now when you make a metal countertop, you begin with 14-gauge metal. That's about a sixteenth of an inch thick. For a metal like zinc, 14 gauge is more than enough. It's beyond commercial grade. You really couldn't dent it except with a full on blow with a hammer. We bend that metal down and back again. There's a return on the bottom so there's no sharp edges. And we bond it to a waterproof fiber core so that it's solid at all points. It should always feel solid. It should never oil-can. It should be in contact with a subsurface 100%. Having done that, we want to apply a finish to our zinc metal. I'm going to put some samples up as I speak. This is matte finished zinc. And that's raw metal. There's no lacquer coating. That will oxidize in time and just kind of be dull. It can react with certain foods. Strong vinegar, if left in a puddle, will turn that dark. In general, you can remove those marks with a Scotch-Brite pad along with a good scrub. You will never wear through your zinc at 14 gauge. It's a very thick metal. Here's another way to finish zinc. It's a patina. It's chemically aged to a dark coating. It's a very thin patina. You can wear through it. And part of the charm of patinated zinc is that we're going to wear through and have a pattern of use. That's going to be very traditional-looking, very rustic. Another look for zinc is a distressed version. We've got a great guy back in the shop, beats it up with a hammer. He does some great distressing to zinc, and it really gives it an old world look, an old world charm. But even better is when we hand hammer zinc. Now this example is of hand hammered and it has rivets as well. What you can see on this, it's got the look of parged clay, a very soft looking metal that you want to reach out and touch. Zinc has got a nice feel to it. It's not cold …and I'm going to hold this up beside stainless steel, so you can see the color difference between zinc and stainless. Stainless on my right; zinc on my left. Now we can solder and weld zinc. We can make integral sinks. We can join large sheets of zinc. In the field, when we want to put two sheets together, generally they're going to look like this. You will see an unobtrusive joint. Mostly it's a mechanical joint. We don't try and weld in place at home. And we feel it's best to just let that joint be part of the design. Again it's a rustic product. Here's a great sample of zinc that we have quilted. So we put in a series of creases in it using a press break. And we very often use these panels for back splashes. You could see where we've finished the edge. It’s turned in. We can take a series of panels with those returns on them. We'll put them next to each other for a very professional joint. That's a field joint for a wall panel in zinc. We can make range hoods out zinc. And because zinc is a malleable metal, we can bend it, make fancy edges. Here's a great edge. We'll put these two together. We can also mirror polish zinc. So here's a sample of zinc with a rivet and mirrored polish and we very often use zinc as a metal to make range hoods and get great effects, rivets, bands and bars. Zinc is a very hot metal. It's often combined with the wood of the year, which is walnut. It's got a great color. We're lucky to have a great crew skilled in working with this unique metal, Zinc. 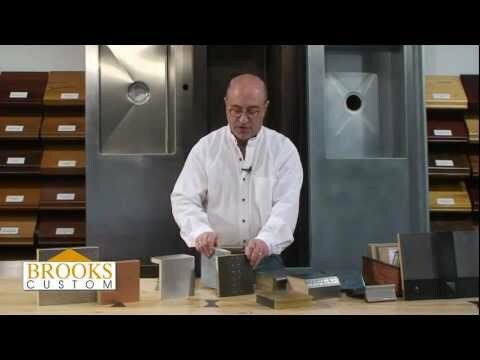 Recording: Brooks Custom creates luxury furniture and countertops from wood, metal, concrete and glass. Contact out expert design team for quality custom manufacture and delivery worldwide. Hi, I'm Richard Brooks. We're talking about countertops made from the metal zinc. Now zinc is a metal and is the most common element on the planet earth. It's in baby powder. It's in most of the tools and things we use in everyday circumstance. Zinc is safe. It's non-toxic. It's a hygienic metal. It's great for food prep. It's a charming metal. You have to remember; zinc is soft metal. It can scratch. It won't dent. It will patinate in time. It will take on a very dull pewter color. It's commonly used in traditional kitchens or butler’s pantries and kitchen islands. Now let's take a look at some of the finishes available using this incredible material. Now when you make a metal countertop, you begin with 14-gauge metal. That's about a sixteenth of an inch thick. For a metal like zinc, 14 gauge is more than enough. It's beyond the commercial grade. You really couldn't dent it except with a full on blow with a hammer. We bend that metal down and back again. There's a return on the bottom so there are no sharp edges. And we bond it to a waterproof fiber core so that it's solid at all points. It should always feel solid. It should never oil-can. It should be in contact with a subsurface 100%. Having done that, we want to apply a finish to our zinc metal. I'm going to put some samples up as I speak. This is matte finished zinc. And that's raw metal. There's no lacquer coating. That will oxidize in time and just be kind of dull. It can react with certain foods. Strong vinegar, if left in a puddle, will turn that dark. In general, you can remove those marks with a Scotch-Brite pad along with a good scrub. You will never wear through your zinc at 14 gauge. It's a very thick metal. Here's another way to finish zinc. It's a patina. It's chemically aged to a dark coating. It's a very thin patina which can wear through. And part of the charm of patinated zinc is that we're going to wear through and have a pattern of use. That's going to be very traditional-looking, very rustic. Another look for zinc is a distressed version. We've got a great guy back in the shop, beats it up with a hammer. He does some great distressing to zinc, and it really gives it an old world look, an old world charm. But even better is when we hand hammer zinc. Now, this example is of hand hammered and it has rivets as well. What you can see on this, it's got the look of parged clay, a very soft looking metal that you want to reach out and touch. Zinc has got a nice feel to it. It's not cold …and I'm going to hold this up beside stainless steel, so you can see the color difference between zinc and stainless. Stainless on my right; zinc on my left. Now we can solder and weld zinc. We can make integral sinks. We can join large sheets of zinc. In the field, when we want to put two sheets together, generally they're going to look like this. You will see an unobtrusive joint. Mostly it's a mechanical joint. We don't try and weld in place at home. And we feel it's best to just let that joint be part of the design. Again it's a rustic product. Here's a great sample of zinc that we have quilted. So we put in a series of creases in it using a press brake. And we very often use these panels for back splashes. You could see where we've finished the edge. It’s turned in. We can take a series of panels with those returns on them. We'll put them next to each other for a very professional joint. That's a field joint for a wall panel in zinc. We can make range hoods out zinc. And because zinc is a malleable metal, we can bend it, make fancy edges. Here's a great edge. We'll put these two together. We can also mirror polish zinc. So here's a sample of zinc with a rivet and mirrored polish and we very often use zinc as a metal to make range hoods and get great effects, rivets, bands, and bars. Zinc is a very hot metal. It's often combined with the wood of the year, which is walnut. It's got a great color. We're lucky to have a great crew skilled in working with this unique metal, Zinc. Recording: Brooks Custom creates luxury furniture and countertops from wood, metal, concrete and glass. Contact our expert design team for quality custom manufacture and delivery worldwide. For more information on zinc countertops, please email quotes@brookscustom.com.